JAPANESE corporate giant Toshiba has announced that its Westinghouse nuclear power unit has filed for Chapter 11 bankruptcy in the US, largely due to massive cost overruns for four reactor projects the company is building in South Carolina and Georgia. The financial loss to Toshiba is estimated to be about 1 trillion yen (about $9 billion) for the fiscal year that ended yesterday (March 31), which would be one of, if not the biggest, annual loss in Japanese corporate history. Officials at both W estinghouse and parent company Toshiba are optimistic that the collapse is not total; the financial problems are rooted in Westinghouse’s construction division, while its nuclear fuel and plant operations/maintenance segments remain relatively profitable. On the other hand, the bankruptcy filing is glaring evidence that these same people have been very wrong before; every other objective indicator suggests that Westinghouse’s fall may be a fatal blow to what nuclear advocates were hoping would be a bit of a renaissance for nuclear power worldwide. The Westinghouse Electric Company LLC is a remnant of the fabled US corporate giant Westinghouse, which was founded in 1886. Through the mid-1990s the original company was gradually broken up and sold off; the brand is still well known worldwide – mainly in household appliances and certain kinds of industrial equipment – but is owned and produced by a variety of unrelated parent companies. The nuclear power business has historically been one of Westinghouse’s strengths, and reached its zenith during the 1970s; a majority of the several dozen operating nuclear reactors in the US were built by Westinghouse, and it built reactors in several other countries. The mothballed Bataan Nuclear Power Plant (BNPP) here in the Philippines is a Westinghouse product. The company has over the years become embroiled in controversy at times – the BNPP being one example – but on the whole remained fairly sound, and was considered a good investment when it was purchased in 1999 by British Nuclear Fuels Limited (BNFL). BNFL in turn sold Westinghouse to Toshiba in 2006 for $5.4 billion, just at a time when the prevailing view was that nuclear power was about to undergo a resurgence; China, the US and the UK were all then planning to invest heavily in new nuclear power facilities. Toshiba thought they had a gold mine on their hands. Westinghouse had a new, marketable reactor design – the AP1000 – which had become the first Generation III+ design to receive final design approval from the US Nuclear Regulatory Commission (NRC) in 2004. 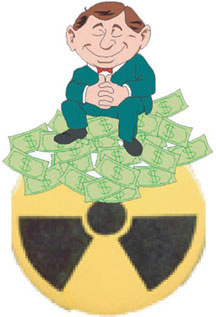 The Japanese parent company sold 10 percent of its stake to the Kazakh national uranium company (Kazatomprom) in 2007 to secure a fuel source and strengthen its supply line, and in the same year won a bid from the China National Nuclear Corporation for construction of four AP1000 reactors and transfer of the AP1000 technology. In 2008, Westinghouse won a contract from Georgia Power Company to build two AP1000 reactors in that state and a second contract to build two more in South Carolina; two years later, the US government announced it would provide $8.3 billion in loan guarantees to complete the Georgia plant. The Fukushima nuclear disaster in March 2011 and the boom in natural gas production in the US had a chilling effect on the plans for new nuclear plants in the US. Even without Fukushima raising safety concerns, nuclear plants suddenly became unreasonably expensive compared with gas-fired plants, which put a bit of pressure on Westinghouse. What really sank the company, however, was the enormous cost and schedule overruns at its Georgia and South Carolina projects. Both were expected to cost about $14 billion each, and be operational by the end of last year; so far, they have cost $19 billion and $22 billion, respectively, and are two years or more behind schedule. To make matters worse, the financial trouble at Westinghouse has raised old, but still not completely answered, questions from regulators – in the US, the UK, and China – about the safety of the AP1000 reactors. Up to now, most of those concerns have been deflected, but what is likely to happen now, even if Westinghouse can continue to satisfactorily convince governments and potential operators of the system’s safety, is that uncertainty over whether the company – or more likely, whoever buys the ailing unit from Toshiba – can be relied on to keep up standards is going to make big customers look elsewhere. And once they do, they are likely to prefer the more economical and less contentious path countries like the US are taking, turning to gas generation or expanding renewables. Where Toshiba’s $10bn nuclear debt came from: the Vogtle AP1000 construction site in Georgia, under inspection by NRC Commissioner Svinicki. News that one of the world’s biggest nuclear power constructors, Westinghouse, has filed for bankruptcy in with debts of over $10 billion has put the entire sector on notice and issued a dire warning to nuclear investors everywhere, writes Jim Green. Among the likely casualties: the UK’s Moorside nuclear complex in Cumbria. The rapidly-evolving nuclear power crisis escalated dramatically yesterday when US nuclear giant Westinghouse, a subsidiary of Japanese conglomerate Toshiba, filed for bankruptcy. The Chapter 11 filing took place in the US Bankruptcy Court for the Southern District of New York in New York City. Westinghouse and its parent Toshiba are in crisis because of massive cost overruns building four ‘AP1000’ nuclear power reactors in the southern US states of Georgia and South Carolina. The combined cost overruns for the four reactors now amount to about $1.2 billion and counting. And it has now emerged that they may never be finished at all. Whether the four reactors will be completed is now subject to an “assessment period”, according to Westinghouse. The corporate mishap may also signal the end of new nuclear power in the US. No other reactors are under construction in the country and there is no likelihood of any new reactors in the foreseeable future. The US reactor fleet is one of the oldest in the world, with 44 out of its 99 reactors having been operated for four decades or more. A $10 billion financial hole – and it’s getting deeper! The same could be said about Toshiba, which is selling profitable businesses to stave off bankruptcy. Toshiba said yesterday it expects to book a net loss of $9.1 billion for the current fiscal year, which ends on Friday – a record loss for a Japanese manufacturer. Westinghouse is the major member of the Nugen consortium that’s set to build a massive three-reactor AP1000 nuclear complex at Moorside in the UK, next to the Sellafield site. The company has already stated that while it intends to progress the project through planning stages, it is unable to take on financing or construction and intends to sell its share. Nugen’s other member, the French energy company Engie (formerly GDF Suez) has also gone on record as wanting to extricate itself from the Moorside project in favour of the ‘new energy’ economy based on renewable, storage and smart grid technologies. It’s now looking increasingly probable that the Moorside project, given the state of the Nugen consortium and the massive failure of the AP1000 design, may never progress to construction. The good news for the nuclear industry? The UK’s Office of Nuclear Regulation (ONR) today – with impeccable timing – accepted the AP1000 design as “suitable for construction in the UK“ and issued Westinghouse a Design Acceptance Certificate. Is the nuclear game up at last? A similar crisis is unfolding in France, which has 58 power reactors but just one under construction. French ‘EPR’ reactors under construction in France (Flamanville) and Finland are three times over budget – the combined cost overruns for the two reactors amount to about €12.7 billion and counting. The French government is selling assets so it can prop up its heavily indebted nuclear utilities Areva and EDF. The French nuclear industry is in its “worst situation ever” according to former EDF director Gérard Magnin. Meanwhile a simple comparison of decommissioning provision between France and Germany indicates that EDF has massively under-budgetted for its liabilities. Germany has set aside €38 billion to decommission its 17 nuclear reactors (€2.2 billion each), but France has set aside only €23 billion to decommission its 58 reactors (€0.4 billion each). When the real costs, for which EDF will be liable, come in, they could easily bankrupt the company. This in turn puts the UK’s Hinkley Point double EPR nuclear project, in which EDF is the main partner, in doubt. The crisis-ridden US, French and Japanese nuclear industries account for half of worldwide nuclear power generation. Other countries with crisis-ridden nuclear programs or nuclear phase-out policies account for more than half of worldwide nuclear power generation. Meranwhile renewable energy generation doubled over the past decade and strong growth, driven by sharp cost decreases, will continue for the foreseeable future. TOKYO (Kyodo) — Toshiba Corp. said Wednesday its troubled U.S. nuclear unit Westinghouse Electric Co. has filed for Chapter 11 and it could post a net loss of over 1 trillion yen, the biggest ever for a Japanese manufacturer. Westinghouse filed for bankruptcy protection in the U.S. Bankruptcy Court for the Southern District of New York, as the Japanese parent company was rushing to limit further losses from the U.S. unit and looking to exit the money-losing overseas nuclear business. With the do-or-die decision on the filing, Toshiba will make all-out efforts to move out of its financial woes, Toshiba President Satoshi Tsunakawa told a press conference in Tokyo after Westinghouse filed for bankruptcy. “We are almost risk-free as we are pulling out of overseas nuclear operations, the biggest problem,” he said. Toshiba said it could post a group net loss of 1.01 trillion yen ($9.13 billion) for the fiscal year ending on Friday, with massive costs related to the Chapter 11 filing. Westinghouse has $9.8 billion in total liabilities, much of which must be shouldered by Toshiba under a debt guarantee for the U.S. unit. The estimated net loss would eclipse 787.3 billion yen posted by Hitachi Ltd. in the year to March 2009 following the 2008 global financial crisis and would be much worse than the 390 billion yen loss the company projected in February. The huge loss would put the company in a negative net worth of 620 billion yen at the end of March, Toshiba said, far larger than the 150 billion yen it previously estimated. Tsunakawa said that he feels responsibility for the company’s crisis but has no intention to step down as chief executive. He took the helm at the company last June after it had been hit by an accounting scandal in 2015. The bankruptcy filing will deconsolidate Westinghouse from Toshiba’s financial results for the current fiscal year. The company has been under pressure to have Westinghouse file for bankruptcy protection, as the unit is the main cause of its massive losses with delays in U.S. plant projects leading to cost overruns, informed sources have said. The nuclear-to-electronics conglomerate was looking to finalize losses related to the unit within the current fiscal year through the bankruptcy filing. In February, Toshiba said it was expecting a loss of 712.5 billion yen in its U.S. nuclear business for the nine months through December on an unaudited basis. The company had to delay its earnings announcement twice, saying it needed more time to look into an accounting problem at Westinghouse. Faced with ballooning losses, Toshiba had been considering a way to separate itself from the debacle at Westinghouse, which it bought in 2006 as a step to tap into overseas markets. The cash-strapped company has decided to spin off its prized memory chip business and sell a majority stake, or even the whole operation, to raise funds to bolster its financial standing. Toshiba closed the first round of bids Wednesday for the new semiconductor division that it plans to establish on Saturday. It has likely attracted 10 bidders and will choose the preferred buyer in May, according to sources close to the matter. Tsunakawa is confident that the bidders have a strong financial standing and the proceeds from the sale will be able to eliminate the company’s liabilities. He estimates the value of the chip business at 2 trillion yen at least, and said he expects the value to continue to rise. Toshiba is seeking support from Korea Electric Power Corp. as a sponsor, aiming to sell its Westinghouse shares to the South Korean utility. “We are focused on developing a plan of reorganization to emerge from Chapter 11 as a stronger company while continuing to be a global nuclear technology leader,” Westinghouse Interim President and Chief Executive Officer Jose Emeterio Gutierrez said in a release. The company turned the corner in stemming the bleeding for the time being. But the fate of its turnaround remains unclear. The sale of Westinghouse and the pullout of the overseas nuclear business will leave the company with no core profit-making businesses after it sold its cash-cow medical business and as it plans to sell its chip operation. The outlook for the sale of the U.S. unit is far from certain. Toshiba may find it difficult to attract a buyer with slowing demand for nuclear power generation after the 2011 Fukushima nuclear crisis. the chances of altering how the legislation works appear to be dimming….it looks increasingly likely that the Obama visit will center instead around job-creating deals for the U.S………..Nowhere did the statement contain a reference to the nuclear deal. The nuclear resuscitation could be falling apart faster than anticipated. India has been the big hope for USA’s struggling nuclear salesman, Westinghouse and others. But its new Liability Bill does not give them the certainty from financial accountability – they wanted to never have to pay up, (just like Union Carbide didn’t have to pay up for the Bhopal gas disaster). They might have to pull out! Germany – Angela Merkel’s government is on the line, as opposition grows within and without Germany, to the continuance of their old nuclear reactors. And the nuclear lobby so desperately wants to stomp on Germany’s success with renewable energy! France – well, Areva’s and EDF’s the much touted new gee whiz nuclear reactors in Finland and France are becoming an embarrassment with their delays and soaring costs, and the UK is not too keen on their product either. And France was the poster boy for nuclear! Meanwhile, Hanoi has been working towards a Section 123 Agreement with the US, which would allow it to import American nuclear technology. Westinghouse Electric and Japan’s Hitachi-GE Nuclear Energy, both of which use American technology, are bidding on the contract for Vietnam’s second reactor. the Indian government tried to limit liability to only if it could be proved that a supplier had done an act ‘with the intent to cause nuclear damage’. This astounding insertion left a huge loophole for contractors doing shoddy work to wriggle out of paying any damages if things go wrong………Given India’s pervasive culture of poor management and corruption, Mr Singh’s government should think carefully before plunging headlong into a risky track from which there is no going back. The Chamber is also of the view that that there should be a provision in the Bill which allows and entitles victims for higher compensation from Higher Courts. It also proposes that the Government may consider provision for cost over runs due to regulatory delays. This week’s protest underlines the uphill battle that nuclear power advocates face in bringing about the trumpeted nuclear renaissance — and not just in the United States. the federal government continues to search for suitable sites for storage of high-level wastes from nuclear power plants and for very long-lived radioactive materials from weapons production. For the time being high-level waste remain on the sites where they were generated…….